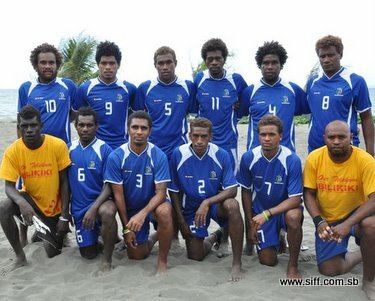 Team manager of the Solomon Islands national beach soccer team, Rueben Oimae, says that 2011 has been a particularly tough year for the management to come up with the final list. “Selection for the team this year has not been as straight forward as the previous ones. This is because we have to balance between the experience of senior players and the talent and energy of the new ones, so some tough choices had to be made,” Oimae says. The final list is a mixture of the old and the new with big names like James Naka fighting off competition to remain in the team against a stiff challenge from the new players in the training squad. Other experienced players Hickley Rence and Michael Taeman have not been able to retain their places in the team and will miss out on the qualifiers but may return to the team if they qualify for the FIFA beach soccer world cup. The new faces in the team are centre player McPhillip Aisa, forward John Oita and also goalkeeper Izomo Bird who had trained with the squad in 2009 but could not travel to the qualifiers then. According to Oimae the new additions have worked hard to get their names in the team and the management is confident that they will do well. “The 3 new players in the lineup are a great addition to our team because they enhance the strength that we have. I am also impressed with their positive attitude towards training and I congratulate them for this achievement,” says Oimae. The majority of the players in the final line up have extensive experience in international competitions including a number who have participated in 4 FIFA beach soccer world cup tournaments. With the current setup the defensive duties will fall mostly to Gideon Omokirio who is also the assistant coach of the Bilikiki but he has good support from Eddie Ngaitini and Timothy Wale who came into the team in 2009 in place of former defender Samson Takayama. The control centre of the Bilikiki attack is managed by Franco Ne’e who has performed excellently in his tactial duties and as a leader on the pitch and he will be happy to have onboard the talented Aisa who is a powerful player with a good eye for goals. Up front James Naka will be leading the attack with the support of youngster Robert Laua and Gibson Hosea who is currently recovering from a knee injury but has been cleared to play by the team’s medical officer, Charles Gauba. Oimae says that he has full confidence in the current team and is sure that they will be able to get the job done in Tahiti. “I have nothing less than full faith in this team. We have worked harder than we ever have because we want to qualify again and do better in the FIFA world cup,” Oimae says. The OFC Beach Soccer Championship will be held in Pape’ete in Tahiti and will be kicking off on the 22nd of this month. Bilikiki will the country this Friday for a 4-day journey to Tahiti.